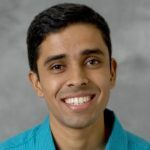 Dharik Mallapragada joined the MIT Energy Initiative in May 2018. Prior to MIT, Dharik worked at ExxonMobil Corporate Strategic Research, where he contributed to research on power systems modeling, life cycle assessment and also led a research program to study energy trends in developing countries. Through hisPh.D. and nearly five years of research experience in the chemicals and energy industry, Dharik has worked on a range of sustainability-focused research topics such as designing light-weight composite materials and carbon-efficient biofuel pathways, as well as developing novel tools for energy systems analysis. His research interests include the design of novel energy conversion processes and their integration into the energy system. At MIT, Dharik is working on advancing power systems modeling tools to study questions around renewables integration and economy-wide electrification. Dharik holds a M.S. and Ph.D. in Chemical Engineering from Purdue University. He received a B.Sc. in Chemical Engineering from the Indian Institute of Technology, Madras.